This is a collection of various photos of some of the first camp guests and trainers training and fighting at Tiger Muya Thai in the beginning. Note: Some of the trainers are no longer working at Tiger Muay Thai. Our Mixed Martial Arts and Muay Thai training camp guests come from around the world and are of different levels of experience from amateur and beginner yo advanced and professional fighters. Training Muay Thai is a lot of fun and is quite exciting. 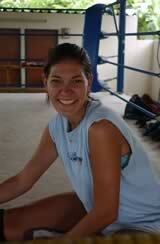 There is nothing like training in the Muay Thai ring with an experienced and professional Muay Thai trainer. Learn to kick, punch, elbow strike and knee strike. Learn to clinch like a real Muay Thai fighter. Great prices and great fun. 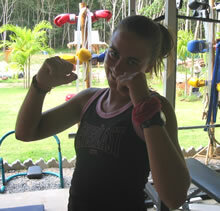 Many of our training camp guests in Phuket, Thailand are fighters from European countries. 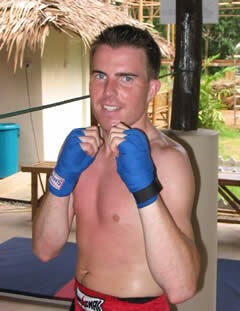 Guests enjoy training Muay Thai @ our camp to prepare for a fight or MMA tournament in their home country. Train here for (1) month and we will make you a better fighter. Many of the guests at our Thai boxing gym are women who are interested in getting fit, losing weight, or increasing their skills in Kick boxing or Muay Thai. Amateur or professional, you are women are welcome to join our training program. Learn Muay Thai and Mixed Martial Arts. Lose weight and gain confidance. Quit smoking, gain discipline and motivation for yourself. Change your life. Come and see us. 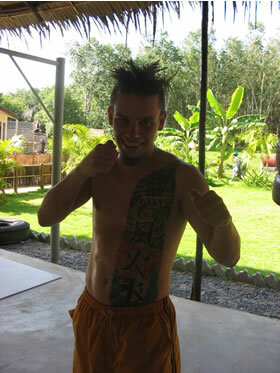 Tiger Muay Thai & MMA training camp guests often prepare for a Muay Thai fight here in Thailand. Every month our training camp has guests / students who are competing in a Muay Thai fight in Phuket, City, Patong, Thailand. Our guests often remark how much they enjoyed the time they spent with the Thai trainers. 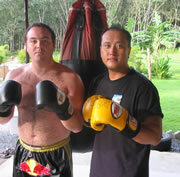 Many guests become good friends with our Muay Thai trainers and other guests. Guests will often eat together at popular local restaurants and tour the island together on fishing trips, bike tours, waterfall tours, and adventure. 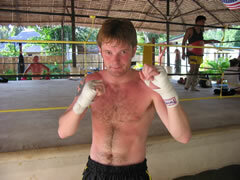 Many of our guests come from Sweden which is a country that loves Muay Thai and the Mixed Martial Arts. Professional fighters enjoy training for 2+ months to prepare for an upcoming MMA or Muay Thai fight. 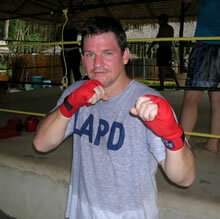 The tropical humidity of Phuket, Thailand is a great place to train Martial Arts. Guests and students @ our training camp in Phuket, Thailand come from a wide variety of Martial Arts: Muay Thai, MMA, Vale Tudo, BJJ, Karate, Judo, Hapkido, Tae Kwon Do, wrestling, Shingi Tai Jiu-Jitsu,and more. 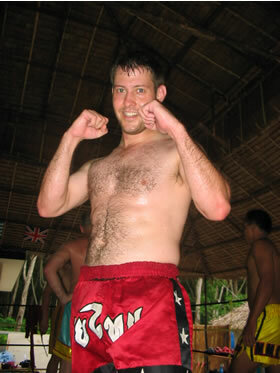 Tiger Muay Thai appreciates guests with experience and are willing to learn new techniques and share common interest in Martial Arts. Getting fit, losing weight and having a great time while training. It is all about atmosphere, reaching goals, and working hard. TMT Phuket, Thailand. 25 % of all our guests want to lose weight and increase their fitness levels. Our training programs will help you lose as much weight as you like and learn Martial Arts in the process. Come and join us now….weight-loss in progess! Some guys just have all the fun. People come to training everyday excited and ready to learn Muay Thai and MMA. It is easy to smile when you are having a good time. Welcome to Phuket. 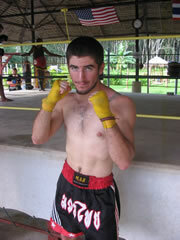 Learn Muay Thai and Mixed Martial Arts at a real training camp with other foreigners and Thai fighters. National U.S Jiu Jitsu Champion and Champion Muay Thai fighters to learn the best technique. Niel has lost 10 kilo of fat and gained the same in Muscle. He trains 5 days a week at Muay Thai. You can gain a lot of muscle and strength when training MMA and Mixed Martial Arts @ our training camp. Gain muscle and lose fat. Many guests are looking to train to get fit and lose weight. By training hard, eating right, and lifting properly a guest can lose as much as 8-10 kilo in one month and gain 2-3 kilo of muscle. Many guests @ our training camp are professional policeman in their home country or are with government agencies and keeping their personal defense skills sharp. Amateurs are welcome at our Thai boxing gym and fitness center. 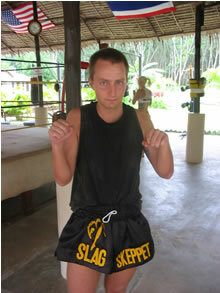 Looking to have a good time, meet people with Martial Arts interest or seeing and touring Thailand. 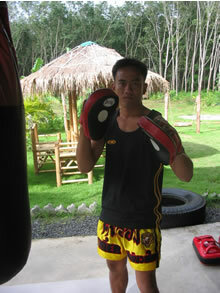 Tiger Muay Thai & MMA Training camp & Fitness Center, Phuket, Thailand is a great place to stay. Wonderful tropical bungalows, fitness gym, martial arts training and located in Chalong close to the beaches and entertainment zones. 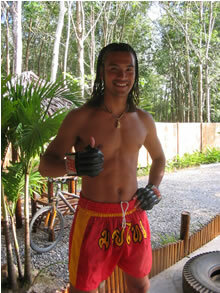 Many of our guests are very experienced and have fought Muay Thai style in their home country. 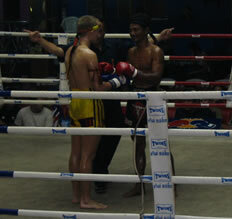 Guests often come and want to make 3+ fights while staying at our training camp in Phuket. Friends often travel togeter and train together at our Muay Thai camp. It is easy to make friends and have great times. Welcome to all. Police Officers from many countries enjoy training 1+ month and touring Thailand. 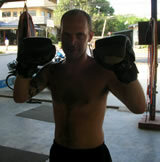 TMT Phuket offers special Defense training sessions w/ our head trainer. 4 Titles in 3 weight classes. Trainer @ Tiger Muay Thai and MMA Training Camp, Phuket, Thailand. 20 Years experience with his national sport. College Degree and speaks English. Honorable Buddhist man with character. Warriors one and all. J.P Pocock, Shingitai Jiu-Jits instructor, Christine Toledo, professional women’s fighter, Allan and Niki from TMT Phuket, Thailand.